The university’s main campus is located on unceded Musqueam territory and the flag raising is part of a wider commitment to Indigenize. A Musqueam welcome pole by Brent Sparrow Jr. was dedicated in 2016, and street signs were unveiled last year that feature Hul’qumi’num names along with English ones. The university also offers six accredited Hul’qumi’num language classes. Musqueam Chief Wayne Sparrow said the flag, featuring the Musqueam logo, is an important milestone for the nation. “The flag is a powerful visual reminder for students and visitors, and especially for our people, who I hope are reminded that this is their traditional homeland,” he said in a statement. 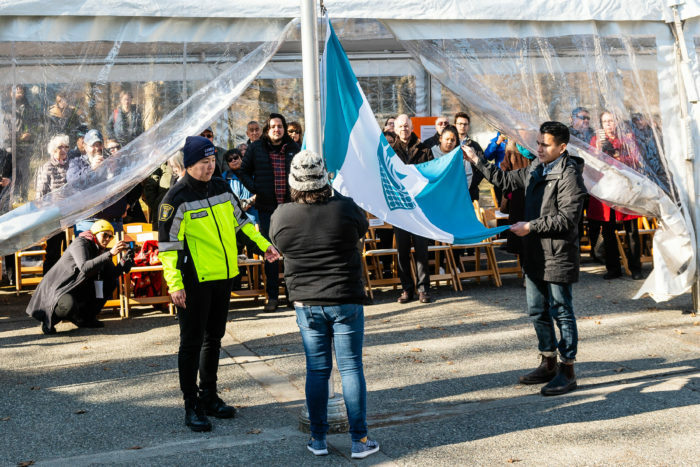 UBC president Santa Ono added that the flag reflects a permanent commitment by the university to Musqueam, which has occupied the territory for millennia. The two parties originally signed a memorandum of affiliation committing to a long-term relationship in 2006. “We are acknowledging this past history but we are also recognizing our present relationship with Musqueam and our responsibilities for future actions with Musqueam and other Indigenous communities in Canada and worldwide,” he said.